RIMPAC-2018: What Makes It So Special This Year? The US-organized biennial Rim of the Pacific (RIMPAC) is the largest international exercise held in and around the Hawaiian Islands and Southern California. The RIMPAC- 2018, the 26th exercise in the series, is running from June 27 to Aug.2 under the motto "Capable, Adaptive, Partners." It involves 46 surface ships, five submarines, 18 national land forces, more than 200 aircraft and 25,000 personnel from twenty five nations. Defending sea lanes is the main mission and there are always political connotations. Besides, many things happened for the first time to make the event stand out this year. It was the first time Brazil, Israel, Sri Lanka and Vietnam were invited. Brazil had to reject the invitation at the last moment for internal reasons. Chile, a non-founding RIMPAC nation, had never before held a top leadership position (component commander) like this year, joining Canadian, Japanese and Australian admirals. The Philippines increased it participation, and Malaysia sent a warship - something it had not done in previous years. For the first time, Israel is among the participants. It demonstrates the US readiness to counter Iran. Israeli sailors can share the experience of mine warfare operations, air defense and conducting commando raids at sea. This year, Israel is also participating for the first time ever in a US European Command exercise. Swift Response is held in Poland, Germany, Latvia, and Lithuania this month. 40 Israeli paratroopers will team with the US Army’s 173rd Airborne Brigade in an operation to seize the Miroslawiec airfield in Poland. So, Israel goes global. RIMPAC-2018 features live firing of a Long Range Anti-Ship Missile (LRASM) from a US Air Force aircraft, surface to ship missiles by the Japan Ground Self-Defense Force, and a Naval Strike Missile (NSM) by the US Army – the first time a land-based unit is participating in a live-fire event. For the first time, the US 3d Fleet commander organized the RIMPAC Innovation Fair in Pearl Harbor (June 28-July 2) to showcase emerging and new technologies, which can be used by navies and marine corps. This is also the first time a US newly created regional command is overseeing the exercise. On May 30, Secretary of Defense James Mattis announced that US Pacific Command (PACOM), which oversees all US military forces in Asia, had changed its name to be called the Indo-Pacific Command (INDOPACOM) to reflect “the increasing connectivity between the Indian and Pacific Oceans,” as well as America’s determination to remain the dominant power in both. The US Navy has stepped up patrols in the proximity of waters adjacent to China-claimed islands in the South China Sea (as has China), raising the prospect of clashes. “When it comes down to introducing what they have done in the South China Sea, there are consequences,” US Defense Secretary James Mattis warned China at the Shangri La Strategic Dialogue in Singapore on June 2. The Pentagon is planning to conduct “a steady drumbeat” of naval operations in waters abutting the disputed islands. Now the main thing – China’s RIMPAC invitation was revoked in May. China first participated in the RIMPAC exercises in 2014. The formal reason given by US military is the “militarization” of artificial islands in the South China Sea. Secretary Mattis said he did not expect countries to choose between the US and China "because a friend does not demand you choose among them." The Chinese Navy has sent a Type 815 intelligence gathering ship to observe the exercise. The list of nations invited to the RIMPAC-2018 obviously reflects the US desire to strengthen its military ties with states on China’s perimeter in an effort to confine it. The US opposes China’s ambitious “One Belt, One Road” economic initiative and encircling the country with US-friendly actors is a vital component of the policy to counter it. The US is testing its combat capability in the two oceans and is doing it with numerous partners. This month, USS Essex amphibious assault ship (jump-jet carrier) with Marine Corps F-35Bs onboard sailed into the Pacific – the second ever deployment of small-deck flattop with the new the aircraft onboard. The F-35 aircraft is known for its stealth design and advanced sensors and controls. Israel was the first nation to ever use the F-35 in combat. This year, it sent the stealth aircraft to attack Iranian training bases and weapons depots in Syria. The plans to sell F-35s to Taiwan are under consideration in the United States. If the deal goes through, the relations with China will greatly deteriorate - the eventuality RIMPAC is taking into account. The voices inside Congress are calling for approval of the sale. RIMPAC is a tool of foreign policy. As US military leaders say it’s about "building relationships", adopting an 'I'm the popular kid on the block' approach to all this," as Peter Layton, visiting fellow at the Griffith Asia Institute in Australia, put it. "We work together, build relationships here, so later on ... it's hard to turn down a friend," said Vice Adm. John Alexander, commander of the US Navy's 3rd Fleet at the opening ceremony. The United States demonstrates its “openness” and the ability to bring together many nations while isolating China and Russia. RIMPAC could have been an event of friendship and peace to bring all the seafaring nations of the region together. Germany’s Kieler Woche (Kiel Week) maritime holiday is an example of how it can be done at global scale. 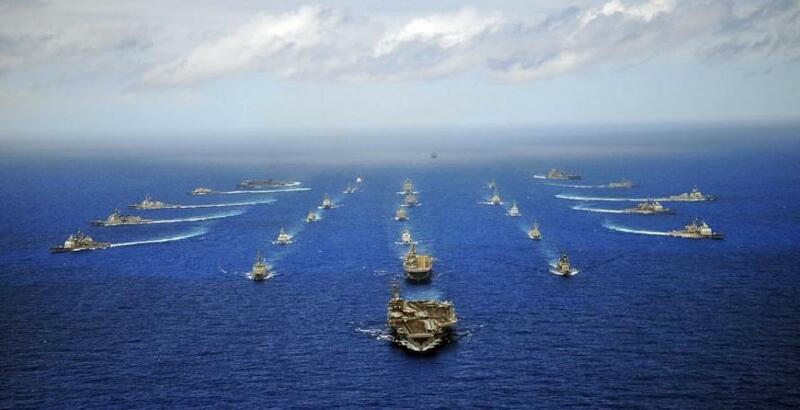 Keeping such large and powerful navies as that of Russia and China out turns RIMPAC into an event organized to bolster US foreign policy goals and challenge its rivals. Actually, it’s US, not international, because other participants have no say in the decision-making process and have to succumb to what America’s commanders tell them while it may not meet their foreign policy goals. The exercise was initially conceived to promote peace and deter terrorists in an international effort but has turned into a demonstration of US readiness to use force against the nations of the region.